When a consumer is looking for something to buy, they want it to be an easy decision, so they will have no regrets or remorse after the purchase. I don't know if that's possible with the current state of Anker's audio products. There are far too many models with rather insignificant differences. Why not just make a few models that are the best and can be recommended to everyone? Unfortunately, when consumers are presented with so many choices, they are easily overwhelmed, and oftentimes, turn away from what they were looking at altogether. 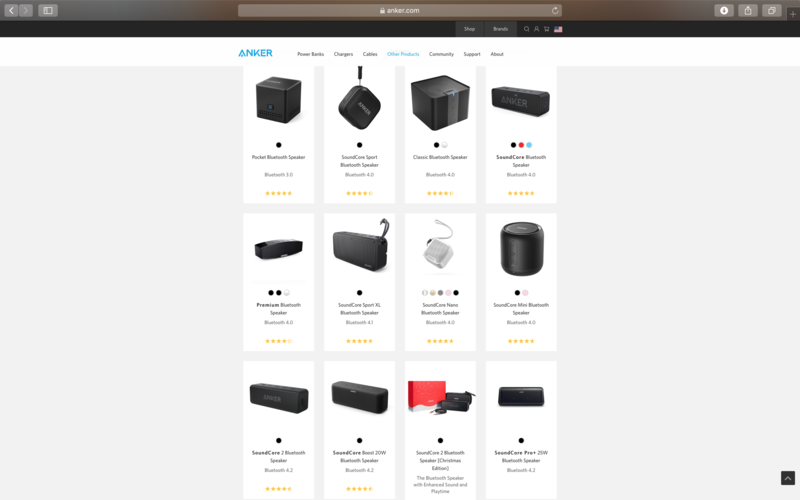 A quick check of Anker's website (not even including the new Soundcore brand) reveals a plethora of audio offerings. 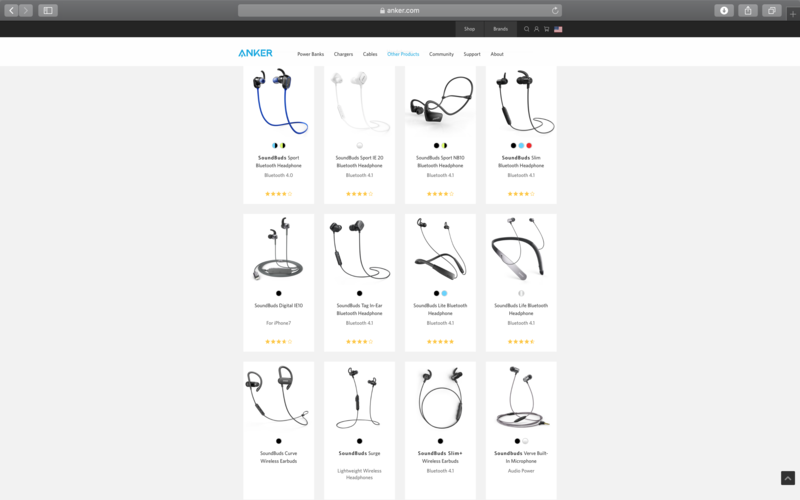 To provide a little more context, AnkerDirect is currently selling 13 different pairs of earbuds via Amazon US. The same seller has listings for 13 different portable speakers. Even for someone who is constantly conducting research on these models, it is very difficult to keep up with the latest and all the little differences. And the lists above don't even include Soundcore's over-ear headphones or truly wireless earbuds. Not only that, but it can even be difficult to recommend a particular model over another unless you have every single one. Unfortunately, this problem doesn't look to stop anytime soon. We know of at least 2 additional pairs of earbuds and 4 speakers that will be launching soon. @AnkerOfficial has stated several times that they are really focusing on releasing a lot of audio products this year. Not only does this add to the confusion of the lineup, but it also has the potential to take away from new releases in Anker's other product areas. Don't get me wrong, I love learning about new Anker products, and it is exciting knowing that you can count on 2-3 new releases each week, but from a consumer's perspective, I think it can get extremely overwhelming when deciphering between the different products. And unfortunately, this can result in less sales. Anyways, what do you all think about my concern here? I am super eager to hear! I totally agree with you @joshuad11. It's nice to have a big selection but it can cause a lot of anxiety when trying to pick one. And as a result, most consumers may just pick one based on price or even skip it all together and go with a competitors. I for one, always research an item before buying because I want the best bang for my buck. Not to mention, I want a high quality item that I know will suit my needs. Perhaps what might help is a "compare" feature? That would definitely help to narrow down the selection to meet ones needs. But overall, it's great to know that Anker is always improving and producing new products. I share your sentiments 100%. I am speculating that the majority of those offerings will not continue to be made, but will be phased out as the current supply sells out, but that does not do much to educate consumers. I don't have a good answer to the problem except to give it time. That being said, I think we can definitely make recommendations. The newest audio products are significantly better than the older ones and therefore are more likely to be a better value buy unless the older one is heavily discounted as is often the case. Yep, it's been mentioned before for the PowerCores and now it seems to have transferred to the audio line. I'm all for innovation, varied buying options, new designs etc but there also has to be a cut off point for the previous models / existing lines. A product line can become too saturated to the point where the tech and non-tech savvy person thinks, 'what do I buy' and then possibly within a few weeks, damn I've made the wrong choice. I also feel it. I'm all for options, but too many can be overwhelming. That said, I'm not sure all those listed products are in active production - maybe @AnkerOfficial can weigh in. They are more streamlined in their other brands - but, then again, there are soundcore products both in Anker's website and in Soundcore's. Their websites also needs some looking into. There are products already in the stores - like the SoundCore Vortex - that are not in the website. A good solution would be creating a "legacy" section on Anker's website for everything no longer in production until they can empty the inventory. I agree that there are to many products available and it gets confusing. As others have mentioned, I think Anker will phase out the products that aren't selling. I like @tiagomota 's idea. Creating a legacy section for products that are out of production or limited run products. Also all products being sold in store and online need to be listed with specs and features across the different website with links to where they can be purchased if they can not be purchased via Amazon or Anker Web Store. I found several products that aren't listed on the website but available in store or on Amazon. These product may have pages now but it would be nice to have the products listed on the website by release date. It would be nice to add a compare products options so customers can pull up several of similar products and see for themselves why each one is different. A legacy section, is a brilliant idea. I can't be alone in buying an older model from a company (for several reasons... Price, spec, a gift, second hand) and not been able to find any info on said product, or not been able to download a manual. Some companies do hold info on their old/older stuff, but generally speaking, most don't. So being able to go to a section specifically for past products is great. The selection can definitely be overwhelming, but as others have stated, there are many products that may no longer be in active production so they will eventually fall off the list as they sell out. I do like how many Amazon descriptions will add "(OLD VERSION)" to the product title when a particular model in replaced by something newer. Perhaps Anker could implement something similar. "(OLD VERSION)" to the product title when a particular model in replaced by something newer. Perhaps Anker could implement something similar. I think like @Nhi mentioned a compare feature would be super helpful when trying to navigate Ankers and Soundcores wide selection of audio gear. It would give people confidence they chose the right product for them. Agreed. The fact the older models still for sale causes confusion, buying the wrong product. Perhaps include a COMPARE option, so people can chose a couple (or.more) products, and then compare the specs.